The choice of colors for presentation slides is one of the important decisions that must be made at the start of the process of developing your slides. Most organizations today dictate a template with corporate colors that must be used for all presentations outside the organization as part of a branding initiative. In that case, you have no choice in the colors. But many internal presentations and in many other organizations you can choose your slide colors. So how do you choose? Here are some ideas to keep in mind when choosing colors for your next set of presentation slides. Webster’s defines contrast as "To set in opposition, or over against, in order to show the differences between". One of the most common mistakes in selecting colors for presentation slides is to not have enough contrast between the colors chosen for the background and the text or graphics. If you want the audience to see the text or graphics on the screen, they must be in a color that has a high contrast with the background color. This makes the text or graphic appear to float above the background instead of blending into it. In general, this will lead to selecting one of two color schemes – a dark background with light text and graphics or a light background with dark text and graphics. The further apart the colors are the more contrast they will have and the easier it will be for audiences to see the text or graphic you are using. To ensure that the colors you have selected have enough contrast, use the online Color Contrast Calculator to test the colors using the two international standard tests for color contrast. If you work for a corporate or non-corporate organization, it is likely that you have a mandated template to use that defines the branding, fonts, colors, etc. Why do you need to know about color choice when the organization's branding staff have already made these decisions? It is important to know how to select colors because when you create diagrams, graphs, or other visuals, you may have to select colors so that explanatory text can be seen on top of a shape or part of a graph. Not all the decisions about color choice can be defined within a template, so you need to apply these guidelines using the colors defined in your organization's template. Red & Green – these two colors clash with each other and are very hard to read. Also, people who have color deficiency will have trouble figuring out what you are trying to say on the slide (use the tool in this article to check colors for color deficiency). Red & Blue – these two colors just do not have enough contrast to be seen well when used together. This combination also seems to suffer a further loss of contrast when projected on a screen. 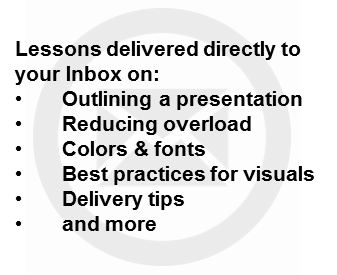 When you have carefully selected colors for your slides, you want them to look good when projected to the audience. The best connection is achieved when using a digital connection to the projector or screen if it is available. How you connect will depend on what ports your laptop has. Here are the most common options and the equipment I recommend using in each case.